The difficulties peculiar to Astronomy, and the means of obviating them. Plan to be pursued. Description of Instruments. The Pendulum the Measure of Time; its irregularities; the means of correcting them. Astronomical Quadrant and Circular Instruments; Hadley's Quadrant; Artificial Horizon; Transit Instruments. ... other instrument, and as our imaginary astronomer will have occasion to make use of it, some description may not be uninteresting. The principle on which it depends is the apparent coincidences of two images: one seen by reflexions, the other viewed directly. For this purpose there are two mirrors. One of these has a part of the quicksilver scraped off; through this vacant part one of the objects is viewed directly, and the other object is reflected from the largest mirror to that part of the small one, which is silvered, the index being moved until they coincide. For the purposes of more accurate observation a small telescope magnifying a few times is usually added. By this means the objects become better defined, and the results are more to be relied on. The great circumstance on which the vast utility of this instrument depends is this. That during an observation it may be held in the hand. There is no necessity for any steadiness any firm support. It is this which makes it valuable to the navigator admidst the unsteadiness and fluctuations of the element which he traverses. On this he securely relies. Notwithstanding the motions to which the ship is necessarily subjected, he can make the most accurate observations when he has once, by means of these glasses, brought the edge of the Sun to an apparent coincidence with the distant horizon. It will appear immoveably fixed whatever may be the agitations of the vessel on which he is placed. It is this stability which is so desireable. It enables him readily to measure their angular distance, an object he could have effected by no other instrument. He has no occasion either for a spirit level or a plummet; both would be useless in such a situation. And no other instrument can be rectified without them. There is another advantage peculiar to the sextant. It is the only instrument by which the distance of two celestial objects can be immediately ascertained without the trouble of any calculation. This circumstance renders it of frequent use in ascertaining the distance of the Sun from the Moon, or of the Moon from a star. These means are constantly employed by seamen for determining the longitude. When this instrument is used to ascertain the altitude of an object at sea, it is made, by reflections from the mirror, to coincide with the horizon, which is always at the same distance if the observer is at the same altitude above the level of the water. But when an observation is to be made on shore, the case is altered. There is no horizon to which the object can be compared. At least there is no certain and regular one. The termination of our prospect is generally broken and uneven, intercepted by trees or by hills. 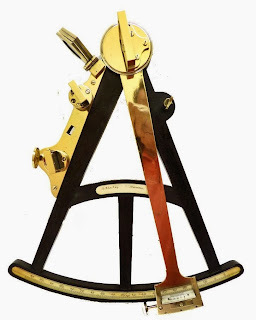 From this cause it would, at first sight, appear that the sextant would be useless in observations on the altitude of the heavenly bodies when made on land. There is however, a method by which this inconvenience experienced by the want of an accurate horizon may be obviated. It was observed that, when we look at a smooth piece of water, all the objects around appear represented in it, but in an inverted position. The houses or trees which are adjacent to it are reflected in the water of exactly the same magnitude the objects really appear to the eye. In fact, the water acts just in the same manner as a looking glass would if laid perfectly horizontal. If now the Sun is above the horizon, it will be reflected in the water and its apparent depression below the surface will be exactly equal to its real elevation. If therefore, we have any means of measuring the angular distance of the Sun from its reflected image in the water, it is clear that its real altitude above the surface of the water must be equal to half this measured angular distance. The reason is evident. The Sun's image appears just as much below the surface of the water as it itself is actually above that surface. Now by means of the sextant this distance may be easily measured. The image of the Sun in the water may be viewed directly and the reflected image may be made to coincide with it. This was doubtless the object which first suggested the idea of an artificial horizon, but it was soon found that the surface of the water exposed to the active air was too unsteady to admit of much accuracy in the observations: various others were substituted, but that which is now universally adopted is quicksilver.